The café "C'est Pas Raisonnable!" on Ixelles high street is a new place for us, but seeing the "bière du mois" sign, we figured it might be worth checking out. The beer of the month was something we'd never had before: Special De Ryck. Turns out it was all quite reasonable, in fact. Pouring it out from its wonderfully mung-bottomed bottle, this beer hit us with a lemony aroma. Fiona said it smelled sour. The taste was something really different. It's not often we find a Belgian beer that doesn't conform to a clear style. This one, though apparently an older Belgian beer category known as "special", really is in a class of its own. Right, so it's unique. But is it any good? Well the first surprise is the mouthfeel, which is a bit thinner than you might expect from just looking at it. The first flavour that hit me was a light caramel with a touch of hamminess, or smokiness, I suppose. A celery note comes in later, and overall, yes, it's a bit sour too. 5.5% alcohol. Fiona is unimpressed and prefers the cool glass to the beer. 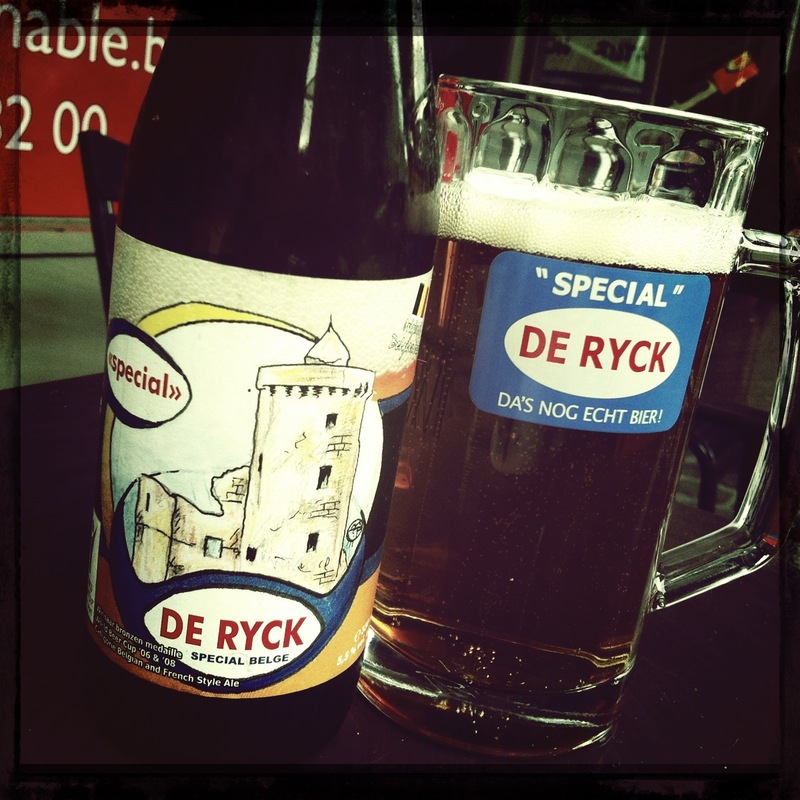 I find it hard to place Special De Ryck, but I rather like it. I think this could even be reasonably sessionable. Hi Andrew, I think the bottles of Special are unfortunately inconsistent. Fontainas usually has it on draft, if you want to see what's like fresh. Nothing flashy but I could drink a lot of it. And thanks for the tip on C'est Pas Raisonnable. Might have to check it out.